Just beyond mile maker one on M-185 thousands have gazed in wonder on this breathtaking arch looming 146 feet above them. The same thousands have ventured up the hills and stared out memorized by the beauty surrounding the island. 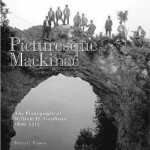 In fact many moons ago, before safety regulations and common sense, many actually ventured out onto the arch itself as seen on the cover of Picturesque Mackinac. Arch Rock is a natural limestone formation most likely formed during the Nipissing post-glacial period (for the geology buffs reading this). Native Americans both feared and awed Arch Rock and believed it was a bridge departed souls crossed to enter their final resting place. They created many legends explaining its formation. According to one legend, an Ottawa chief committed an act so shameful he greatly offended the Master of Life. The Master of Life punished the chief by creating a great turmoil. The turmoil was so great the sun itself turned the color of blood and shot out of the sky. It plummeted toward Mackinac Island and drove through the rocks on the eastern shore forming Arch Rock. About 125 years ago, an artist with the initials “W.K” captured the eye level view of Arch Rock at sunrise on his canvas. 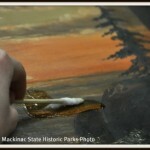 For years the painting hung in Horn’s Gaslight bar on Mackinac Island. It was subject to decades of smoke, kitchen fumes and grime before being acquired by the Mackinac Island State Park Commission (www.mackinacparks.com). 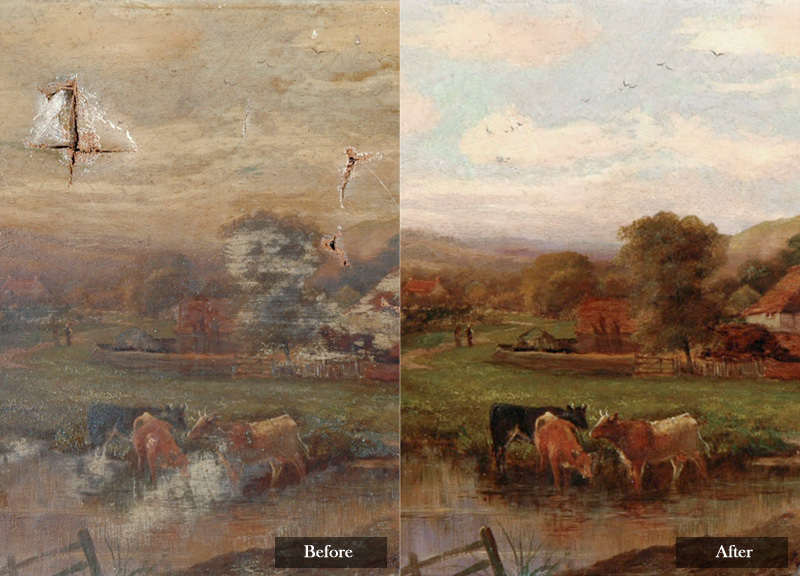 The painting had never been treated, and the heavy layer of grime disfigured the image. Before cleaning the painting, a camera was installed above it so the process could be documented. 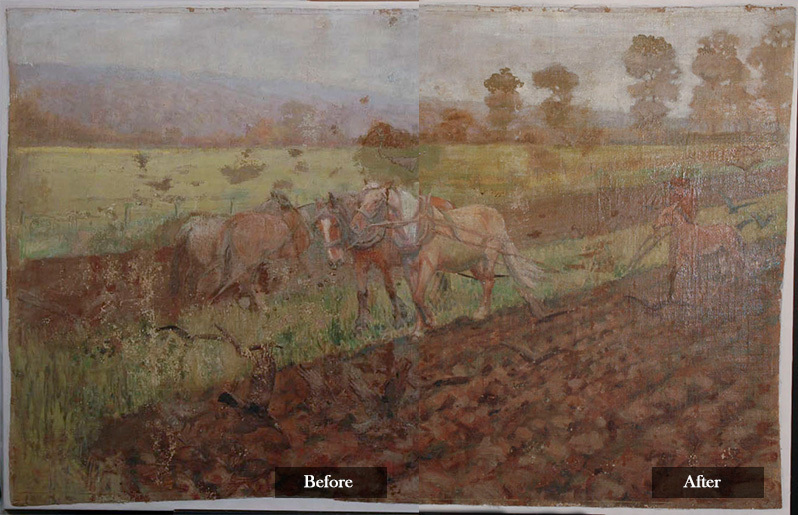 The painting was cleaned with a gel solution and cleared with distilled water. After every few inches of cleaning, a picture was snapped for a total of close to 300 pictures. After the painting was cleaned, the vivid colors of “W.K.”’s palette were revealed. Trees previously disguised by the grime stood out on the rock. The flattened image once again popped from the canvas. The video clip here features ten pictures from the hundreds taken. It takes you from beginning to end of the cleaning process. Although not the full 300, it provides an excellent visual of the effects of surface cleaning. 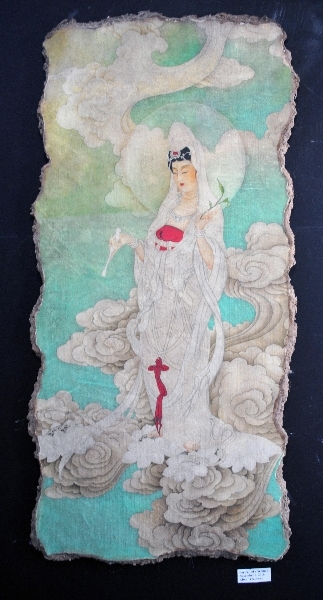 I hope you enjoy as I did uncovering the beauty of this painting. That video does an excellent job of highlighting your work. Those are amazing before and after images of the arch rock painting.